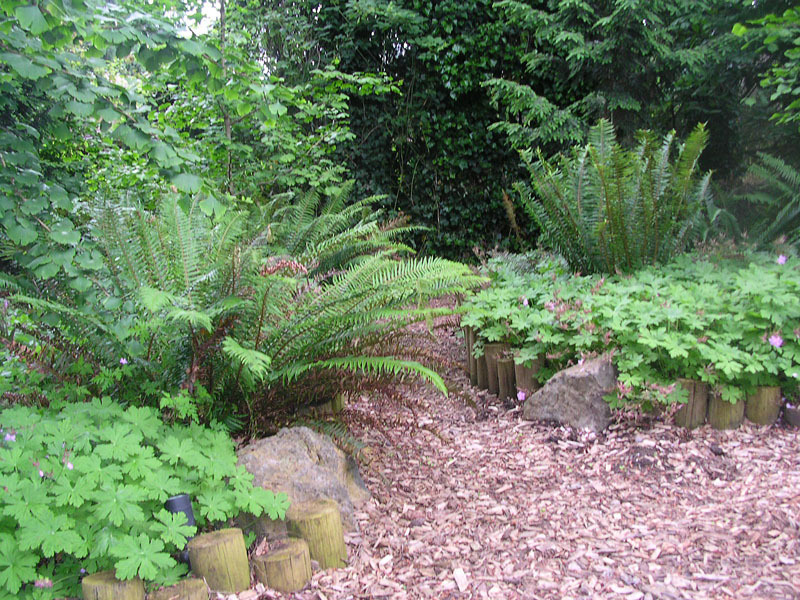 Chris and Jennifer of North Portland contacted me for help with their large shady back yard. They were overwhelmed with the high maintenance of lawn under huge trees. They wanted a back yard for entertaining a large family (with lots of adult kids and future grand kids). They wanted to DIY and had a strict budget, so spending 20 grand on a concrete patio was not realistic. Views over the fence included other neglected yards and they had a large (evil) tree of heaven that had to go. Many plants had died or looked leggy and sun starved. The back yard was longer than deep and made creating a design on their own more difficult. My best contributions were getting the shapes of the new rooms to work with their long but shallow yard. Introducing them to the concept of using cedar chips as their primary surface for entertaining and paths was a perfect fit also. It looks great with their NW Natural style landscape, it’s affordable and it’s very easy to care for. If you get the right kind of chips you can even use a leaf blower on them and they don’t blow away. We tucked different outdoor rooms into the perimeter of the landscape and kept the existing small concrete patio as a spacious entry to the house and the BBQ center. No more trying to fit a dining table on it as they had done before the design. The plant selection was also critical. Shade plants had to survive on the water the big trees would let them have so our palette needed to be all low water plants. 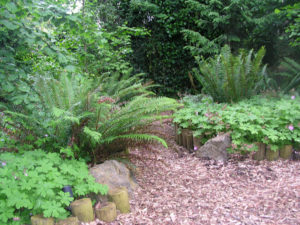 We used a lot of sword ferns and kept native plants wherever possible. On the south end we used one of my favorite little evergreen trees, Boxleaf Azara – Azara Microphylla. They planted them up on a berm which made them taller and helped do a faster job of screening out the neighbors garage wall. Planting Azaras up on a berm prevents root rot since these plants do not tolerate poor drainage. Their DIY install of the landscape turned out fantastic. They loved their back yard. When change came along, and they had to put their house on the market, the yard was another major asset and selling point. These photos, which they took, are from their marketing page. I especially love the hammock room. The fire pit patio is clearly the largest entertaining area and is used for lounging with or without a fire. Their fire pit patio is a crushed rock surface, not cedar chips. The chips continue around to the side yard gate and match the rest of the now low maintenance landscape. Some dogs just can’t help themselves and will try and dig there way to China. Is your shady city backyard with dogs a mud pit? This blog is dedicated to dog joy. It’s time to stop getting mad at your dog for bringing mud and dirt into your house. They can tell we are mad even if we try to hide it. After all, we don’t really expect them to go outside and not get their feet dirty do we? 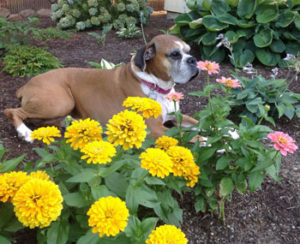 Even dogs like to sit outside and enjoy the flowers. Roxy has a synthetic lawn. Typically the failed lawn is not your fault. Let me spell out the facts as a Portland residential landscape designer sees them. When you bought this house, there was a thriving lawn. You cannot get it to look as good as it did when you moved in. There could be many reasons, but my favorite is what I call the re-sale lawn; the former home owner had new lawn installed to put the house on the market. It looked good just long enough to get the house sold. Your dog has contributed to the demise of the lawn but that was only part of the problem. Trees grow and provide more and more shade as they mature. Lawns require sun. Even 5 years of tree canopy growth is enough to reduce the sunlight. Sun is the number 1 food for lawns. Your lawn is sun starved. Tree roots take up an insane volume of water. Your lawn needs lots of water, which you provide but it is going to the trees. Over time your lawn has lost the two things it requires to grow and thrive. You can replace it, reseed the bare spots, fertilize 6 times a year but it won’t work. Happiness and a mud free yard await your consideration if you can let go of the backyard lawn as you once thought of it. Your landscape designer can create a solution for a shady city backyard. I swear I would not bring this up if I didn’t have solutions, and this issue comes up in about half of my landscape designs each year. Fiber Ex cedar chips make a great lawn alternative. You don’t have to have a lawn in a small shady backyard. 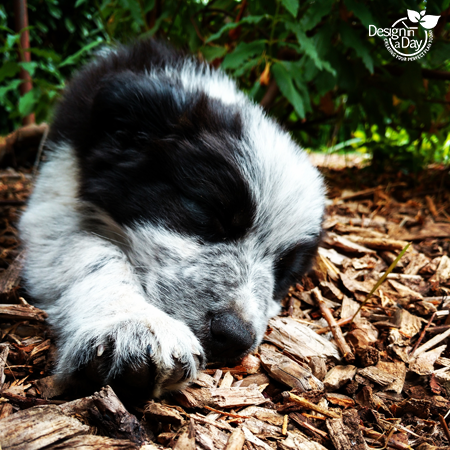 Many dogs are perfectly happy with wide paths or areas of cedar chips. It’s easy to incorporate cedar chips into an attractive Northwest Natural or Asian Style Landscape. 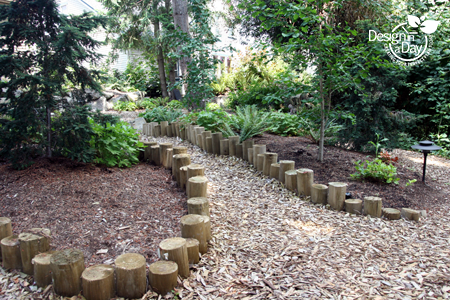 Professional playground cedar chips laid 4 to 6 inches deep is very effective. My favorite is Fiber Ex by Rexius Forest Products, will last for years and is my most affordable solution. The chips work well with even with large dogs and you can’t get much bigger than Newfoundland dogs. My clients Kurt and Jackie are still thrilled with their cedar chip areas for their back yard (going on a decade now). 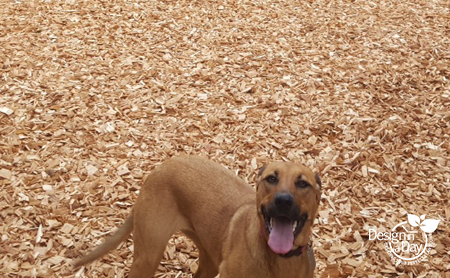 I will note that multiple large active dogs in small yards will kick up mounds or holes in the cedar chip applications which requires raking it back out semi-regularly. Delightful patio replaces stodgy deck – notice the beautiful synthetic lawn at the Blake residence. 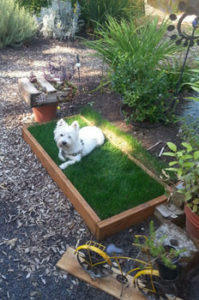 Other clients are using synthetic lawn quite happily with their pets. It looks good…you don’t need to water, fertilize or mow. Even large dogs can romp and chase the ball. It’s easy to clean up dog poo. I am installing a synthetic lawn this year on my 10’ x 10’ roof garden/balcony. We (Daizzie and I) are both going to love the convenience and I like the look. Some clients with very small backyards decide to make the backyard be for people and to hang out with our pets. 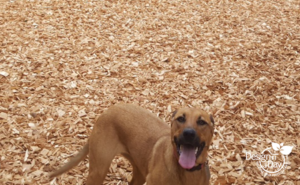 They (the dogs) need a discreet potty place but exercise and leaving liquid social messages for other dogs, happens at the dog park or on walks. The landscape design focuses on entertaining areas, privacy and plantings. A small area of lawn works well for this client’s dog. There are seed strains out there that say they are shade tolerant but trust me…..it’s not happening. If the shade is very light there might be some lawns that will be thick enough for small dogs and people to use but typically shade and dogs means mud without intervention. Give yourself a break and look at lawn alternatives or contact me for a dog friendly landscape design that will make you happy and give your dog joy. Himalayan Maidenhair Fern – Adiantum venustum creeps through rockery. Photo is from one of my Willamette Heights Landscape Designs in Portland, Oregon. I’ve been following Judith Jones and her career as a fern expert extraordinary before social media existed. She’s been my fern guru for 20 years and I’ve tried to catch her lectures when she comes to Portland at Joy Creek Nursery, HPSO plant sales and garden shows. My favorite Judith sighting was at the Seattle Flower and Garden Show when her show garden as the set for the Flintstones. She was dressed as Wilma complete with a bone in her hair. There was a dozen or more 8’ tall tree ferns and a 20’ tall volcano. It looked like a real tropical fern forest. It’s still my favorite show garden of all times. She and her nursery Fancy Fronds have been my source for ferns in my designs. 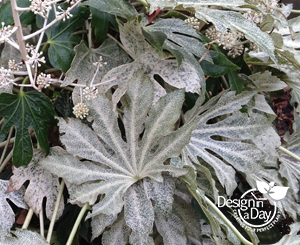 She gave a special program for ANLD Portland Landscape Designers the other evening. She has continued to evolve and had new plants for me to consider as well as highlighting my old favorites. It was such a pleasure to see her and learn more about ferns for landscape designers. Is it possible to have a new fern? This maidenhair was discovered in the 1900’s instead of 2000 bc which makes it new in my book. 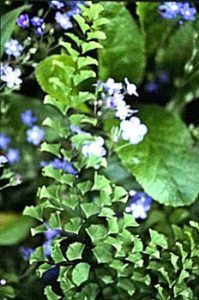 Tracyi is a natural cross between two California native deciduous Maidenhair ferns and oddly enough it is evergreen. Clients like a plant with long seasonal interest. The leaf or pinnae is cute, it has little dimples in the edge of each leaf. The plant is a foot tall and like many Maidenhair ferns, the texture of the plant is what people notice most. The best place to buy it is Judith herself at www.fancyfrondsnursery.com I will list it in the shade category but many maidenhair fern can take some sun and become low water plants over time. Typically, they are listed for moist shade. 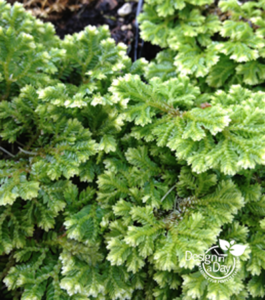 Kraus’ Spikemoss – Selaginella Kraussiana is a low ground cover fern that is underused. Some think it isn’t cold hardy for Portland, Oregon. Not true! I have it growing outdoors in a container where it’s handled many winters. It’s thriving in boulder crevices up in Willamette Heights. Plant it where it will have good drainage and light shade. My descriptive words for Spikemoss are baby chick fluffy, with evergreen piles of adorable pettable texture. Judith feels it is underused and recommends it for Portland designers. Don’t get confused and purchase Peacock moss, Selaginella uncinata because they are devoured by slugs. I’ve been using Spikemoss for years at garden shows to dress up my pottery which is how I know that the millennial generation loves it. They come running into my booth to pet the moss and ask if it is real. Spikemosses are not true mosses and are classed with ferns because they have a vascular system and moss doesn’t. I’ve used Spikemoss in between boulders and I love the effect. 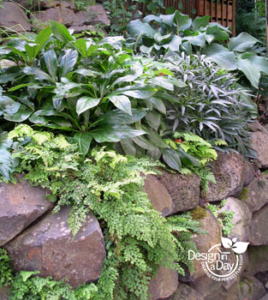 My advice for boulder plantings is plant twice as much as you need, use a mix of compost, clay and sphagnum moss in the crevices. Don’t plant them at the base of boulders; they won’t get enough light. Where it succeeds, it is eye catching with chartreuse fluffy fans against gray boulders. It has succeeded planted under my (containerized) Dwarf Vine Maple for 6 years so cold isn’t an issue. 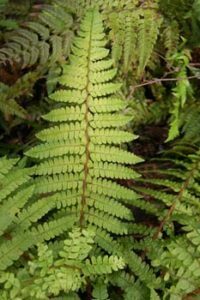 Scaled Male Fern – Dryopteris ‘Stableri Crisped’ – Grow this fern in front of a long fence to make the fence subordinate to the landscape instead of the most prominent feature. 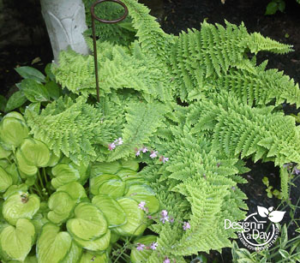 Ferns for Narrow Planting Beds – Narrow Golden Scaled Male Fern-Dryopteris affinis ‘Stableri’ which has no crests and ‘Stableri Crisped’ which has curled and crimped pinnule margins. Think amazing texture! Judith suggests these for narrow planting strips in general and in front of tall fences in particular. My experience is that builders and concrete contractors often create front walks that only leave a skinny strip for plants. Imagine a 6′ tall fence with, you guessed it, about 15” to plant in. 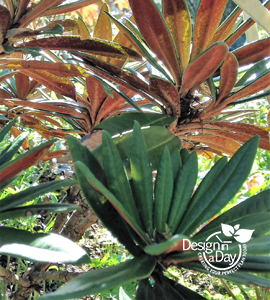 It’s a problem for homeowners and even designers struggle finding plants that fit this situation. Jack hammering out the front walk and starting over with a new one is the best thing if there is space for other options and budget. The rest of the time we find the right plant that will fit that location for years without our clients needing to do much. Can you imagine a fern trimmed into a lollypop? We are trying to avoid that sort of business!! Sigh…….. These handsome ferns could live for decades in that narrow area as long as the soil drains reasonably well. These ferns are also my favorite for visually making the fence subordinate instead of prominent. The narrow vase shape also makes them perfect contrast partners to plants with large leaves like Hosta or Fatsia in larger planting beds. These two ferns could become your new regular use plants in designs. 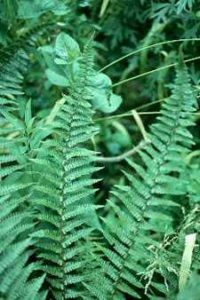 They are evergreen, not as tall as many ferns and look good in foundation plantings. Place them in partly shaded and shady areas. Sword Leafed Holly Fern – Polystichum xiphophylum is neat and small at 15″ tall. Makinoi’s Holly Fern – Polystichum ‘Makinoi’ – Olive, straw gold and russet fern with lustrous fronds is beautifully different than other ferns. Judith says it like this: “There is a reptilian sheen to the olive-green linear-lanceolate fronds which blends subtly into the varied straw to chestnut colored scales cloaking the supporting framework.” It’s typically a 2-footer and evergreen or ever olive. Some filtered morning light is okay but this fern is not for sunny areas. 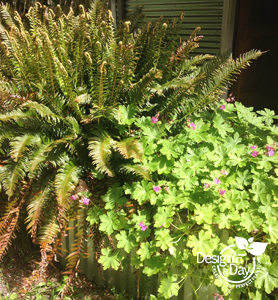 ANLD Member Rick Hansen design Arachniodes Standishii – Upside Down Fern in 2015 Designers Garden Tour. 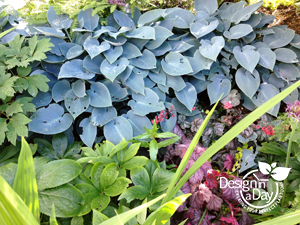 Note the color echo achieved by matching the mid green of the fern with the mid green leaf edge of the hosta. See the contrast from the ruffled texture of the fern with the smooth hosta leaf. Upside Down Fern – Arachniodes Standishii – It’s not an upside down plant but the way the little pinnae are organized is opposite of all the other Arachniodes ferns in the world. 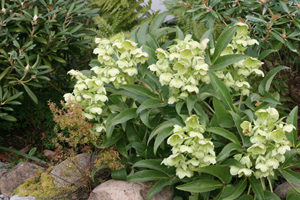 What I care about is that it is cold hardy here (native to Korea and Japan), has an over the top lacy pattern and is easy to grow. It’s semi evergreen. It can take a little direct morning sun, typically place it in filtered shade with some deeper afternoon shade. Plant it in front of other plants for a peek through the lace curtain effect. It can eventually get large (4′ tall and wide) and I am trying mine on the north side where it will get sun until noon in mid June. I’m pushing my luck a bit so we will see if it scorches and if so how long it takes to recover. After the lecture, I bought plants. Even in my near senior status I felt that good old plant lust rise to the surface. I usually don’t indulge in buying plants at lectures. Managing all aspects of my landscape design business doesn’t leave me a lot of time for my former hobby of gardener and plant enthusiast. I must be careful that I don’t kill plant material purchased in a state of amnesia about the reality of my life. I bought these 5 ferns: Tracys Hybrid Maidenhair – Adiantum x traceyi, Narrow Golden Scaled Male Fern Dryopteris x complexa ‘Stableri Crisped’, Arachniodes Standishii, Upside Down Fern, Makinoi’s Holly Fern – Polystichum ‘Makinoi’, and have lost the tag on the last one. It’s clearly a Holly fern of some kind. My clients and I buy ferns directly from Judith off her web site or via an email. I like buying from her and get loads of advice and information when I need it. They arrive in great shape and are mostly sized between a 4” plant and a quart. If you want bigger sizes, contact her before the spring or fall HPSO plant sale and she can bring them down for you. Your clients can buy directly from her too.